Plus 17 more inventive toppings you have to try. 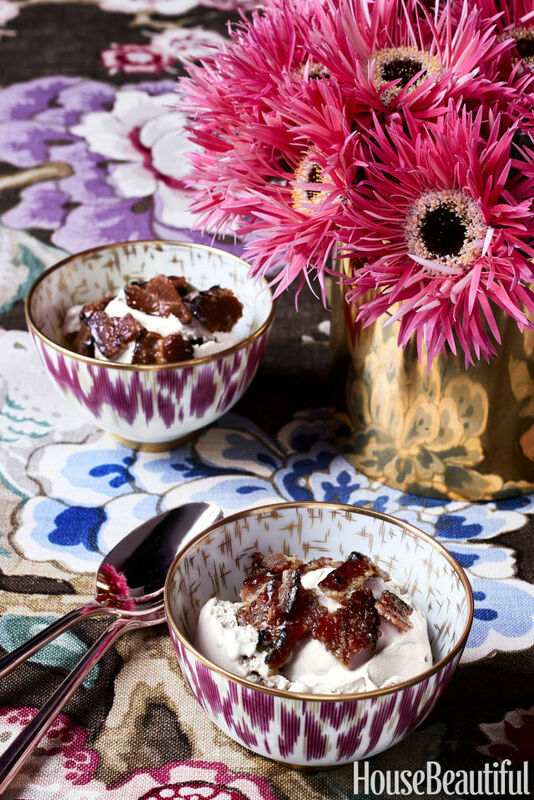 Making ice cream from scratch is hard, so I often opt instead to garnish vanilla Häagen-Dazs with something fun, like candied bacon — easy to make by brushing on maple syrup and brown sugar as it bakes. Delicious! Or, I let the ice cream soften a bit, mix in something like broken-up Butterfingers or cookies — or anything yum — and refreeze. Vanilla doesn't have to be vanilla. Preheat the oven to 325oF. In a small heavy saucepan mix together the syrup, mustard, and sugar and heat slowly on low heat, stirring often. Cook until syrup thickens, about 10 minutes. Set aside. Fry bacon in a large pan on medium-high heat using a “bacon weight” to keep the bacon really flat as it cooks. When the bacon is cooked to your liking, drain the bacon on a paper towel. Lay the flattened bacon on a jelly roll pan and brush the glaze on both sides. Bake for 10 to 12 minutes. Crushed Oreos. I love them. This story originally appeared in the September 2017 issue of House Beautiful.